CCTV has come a long way since the early days of grainy pictures and reels of VHS tapes cluttering up everywhere. Today’s systems are sleek, discreet and provide brilliant picture quality. *Please call us for standard installation details. 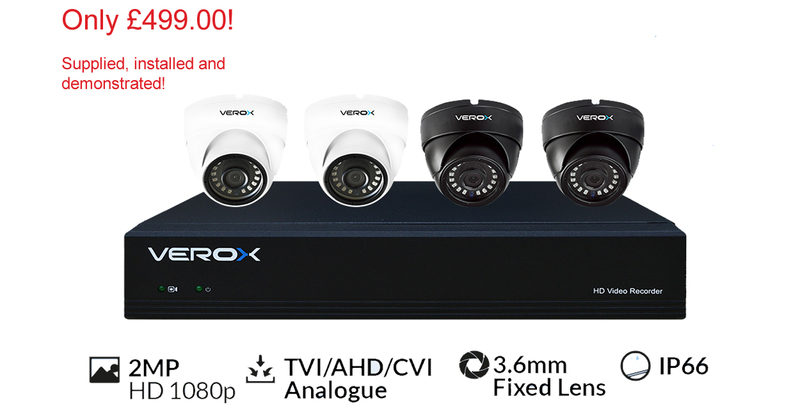 Our CCTV systems come as standard, HD or 4K giving you a wide choice of quality and purpose, depending on what your primary goal is for using CCTV. We can install CCTV at your home or on commercial premises. Single camera systems or multi camera units to cover larger areas - we have experience in fitting simple and complex systems, all tailored to our customers specifications. A CCTV system can act as a deterrent to opportunistic burglars, guard against damage or vandalism and record incidents around your property. There are many advantages to having a CCTV system installed at home or on business premises. Lower insurance premiums are common due to the extra layer of security CCTV provides. You can monitor your house or business premises even while you are away on holiday via your smart phone. Footage can be kept to be screened at a later date if required. CCTV can also be used to provide peace of mind if you have an elderly relative, knowing that you can see they are safe and secure in their own home, providing independence. Complete HD and 4K technology means that images produced by our systems are crystal clear, 24 hours a day. The images are sharp, even in the extreme dark with many systems providing outstanding vision up to 30 metres away. Our fully experienced team at Andrews Television can assess your needs, design a system to suit and install quickly and efficiently. We can even help to maintain the system for years to come. Please call us today to discuss your requirements on 01206 767600. We provide the highest quality TV, Sateliite, Audio and Home Cinema products with the highest quality customer service to match. We can help with this too!